So far, Module Six: The Geography of Africa has focused on the location of Africa, the physical features of the continent, its climate, vegetation, and natural resources. In investigating these characteristics, you have learned that there is great geographic diversity in Africa and, as a consequence of this diversity, peoples and societies develop different ways of living, organizing themselves, and making a living. In addition to studying specific places in Africa and the natural features that characterize these places, geographers are interested in the movement of people, goods, services, social and cultural practices, and knowledge. Another way of saying this is that geography is the study of exchanges, communication, and movement that connect people in different locations. The impact of movement on the people and places where movement originates and the people and places which “receive” the people, goods, services, knowledge, etc. Moreover, as is true for the study of any region of the world, including North America, you can learn much about the history and current situation in various parts of Africa through the study of the movement and exchange of goods, services, people, social and cultural practices, and knowledge. 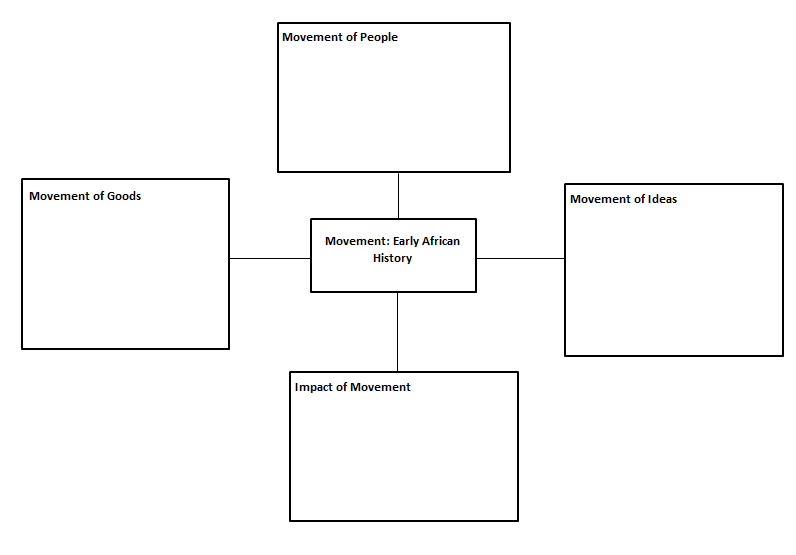 Based on this understanding and with the aid of maps and photographs, this module will investigate four historical periods of movement in Africa. In learning about and from movement in each of these time-periods, the text and class discussion will ask and try to answer three questions. What are the reasons for the movements under study? How, or through what medium, did the movement take place? The place/people “sending” or originating the movement? Places/people through which movement occurred? Your teacher will distribute a graphic organizer activity. After you have read the following text, please complete the graphic organizer. 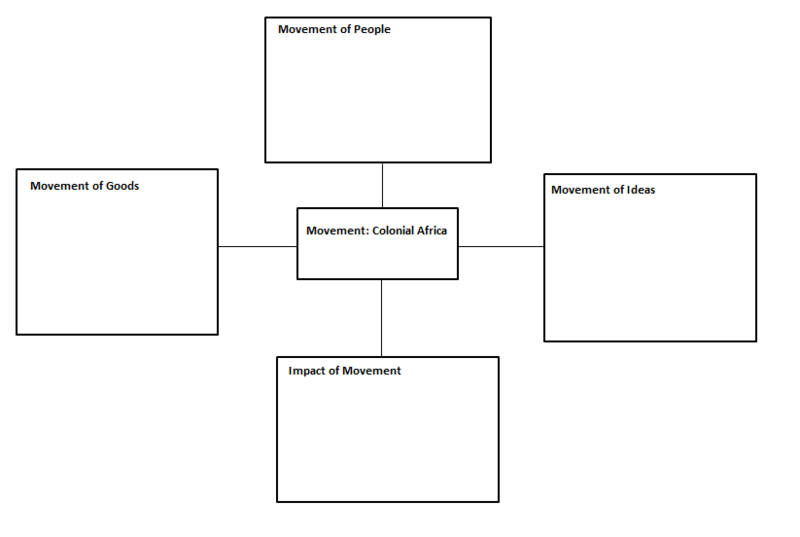 This map was originally used in Module Four: Examining Africa’s History and Global Connections. In that lesson, the map was used to illustrate the rich and diverse history of Africa. 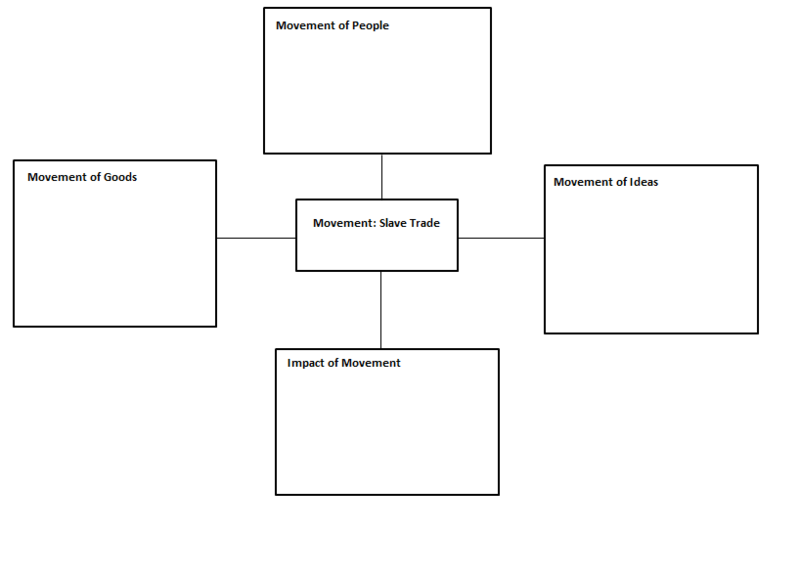 In this section, the map will be used to highlight the movement of people, goods, knowledge, and ideas, both within Africa, and between Africa and neighboring regions in Asia and Europe. This map does not show what many archaeologists consider to be the first inter-continental migration of people, the migration of our early human ancestors from East Africa into Western Asia. Most archaeologists believe that East Africa is the “birthplace” of our earliest human ancestors and the first human societies. Perhaps as long ago as one million years, humans began the first migration out of Africa into western Asia and from there into Europe and the rest of Asia. Africa was an early home of two major world religions, Islam and Christianity. Module Fourteen: The Religions of Africa will provide a detailed look at religion in Africa. This lesson will show that indigenous religious beliefs and practices have been important in Africa for as long as there have been human societies in Africa. Africa was also an early home to Islam and Christianity. As illustrated on the map, Christianity, which developed 2000 years ago in southwestern Asia, moved into Africa within the first century of its founding. Christianity became and remained an important religion in Egypt and from there moved into Libya, Nubia, and Ethiopia centuries before Christianity became established in Europe. In the eighth century of the Common Era, Islam was founded, also in southwestern Asia. As was the case with Christianity, Islam quickly spread west into North Africa, and southwards into East Africa. 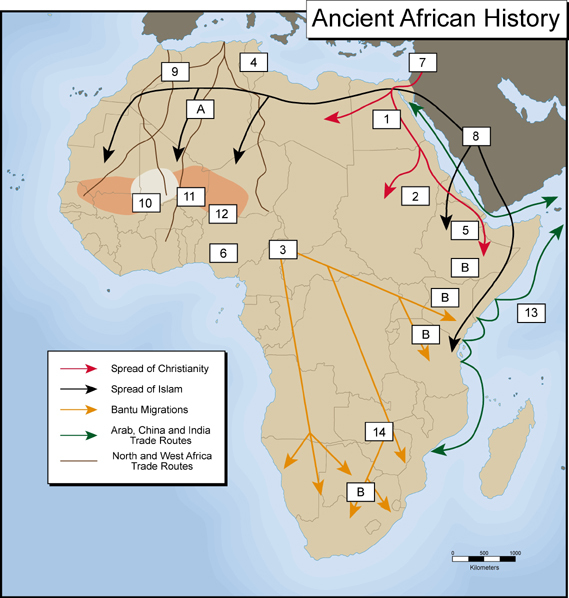 As shown on the map, by the eleventh century C.E., Islam had moved from north West Africa, southwards across the Sahara desert into the Savannah regions of West Africa. Within 500 years of arriving in Africa, Islam had become the largest religion in Africa. The spread of these two religions across parts of the continent had a great impact on the societies, cultures, and peoples who came in contact with them. Christianity and Islam brought with them new ideas and beliefs that influenced not only the beliefs and values of the converts, but also introduced new ways of social, political, and economic organization. However, it is important to recognize that the African peoples and societies also influenced the development of both of these religions. Islam and Christianity, as practiced in various parts of Africa, are different from the practice of these two religions in other parts of the world. From the beginning of human history, people have moved, or migrated, from one location to other locations. People migrate for many reasons. For example, a particular area may experience large population growth that in turn may lead to a shortage of land. In this situation, people with little or no access to land may decide to leave their home areas in search of new areas where land is more available. Approximately 2000 years ago, a massive migration of peoples, which continued for 1500 years, began in Central Africa. This migration is sometimes called the Bantu Migration. It is given this name since it involved the movement of people whose indigenous language belonged to the same language family-the Kongo-Niger language group. Module Eight: Culture and Society in Africa will provide a more detailed discussion of African language groups. Within this language group, there is a common word for human beings: Bantu. Consequently, the Kongo-Niger language group is commonly referred to as the Bantu Language Group. Historians are not in agreement as to why Bantu speaking peoples began to move away from their home areas in Central Africa in the contemporary countries of Cameroon, Congo and Central African Republic. Some historians think that this area experienced rapid population growth at this time that resulted in a shortage of land. Other historians point to the development of centralized kingdoms. The process of bringing people under the control of a central authority resulted in the dislocation of defeated peoples, some of whom migrated in search of autonomy. Whatever the reasons for the migration, there is more information available on the impact of these migrations on East and Southern Africa. 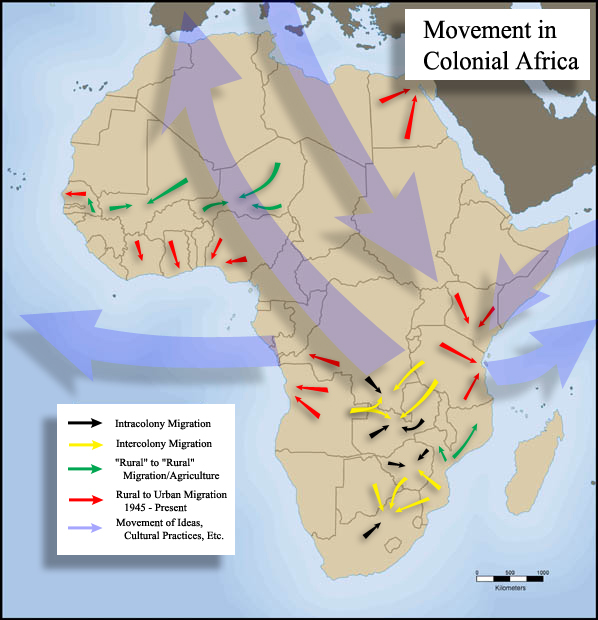 As illustrated on the map, from Central Africa these migrations took some people eastward into present-day Uganda, Kenya, and Tanzania. Other peoples moved to the southeast into present-day Zambia, Malawi, Mozambique, Zimbabwe, and reaching into South Africa by the 14th century C.E. 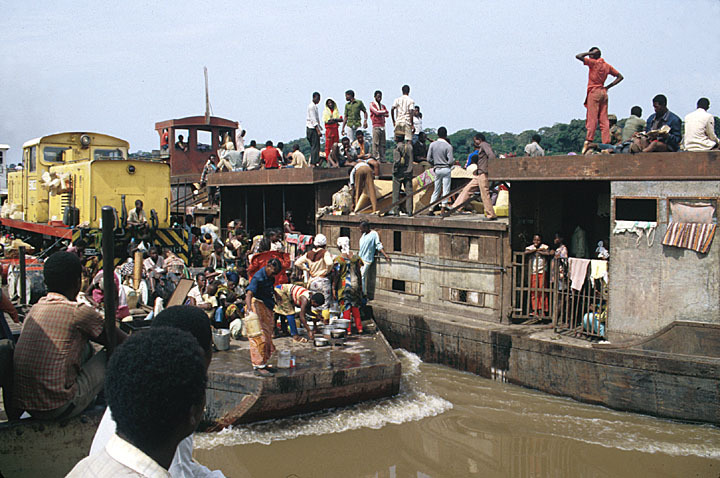 Still other peoples migrated south into contemporary Gabon, Angola, and Namibia. 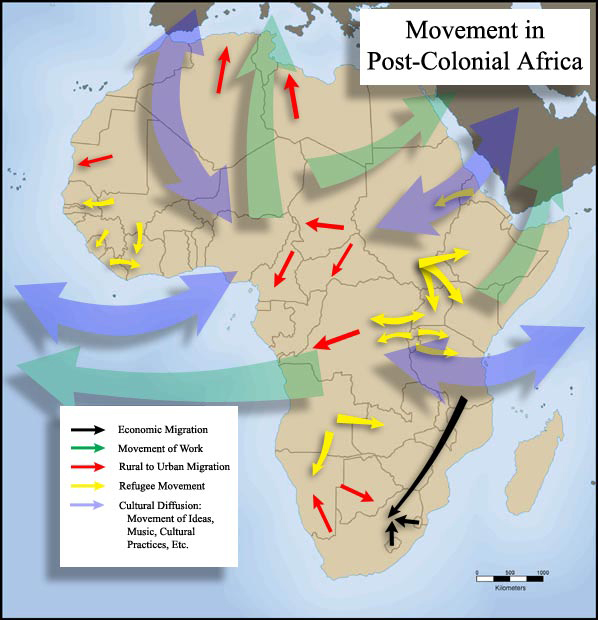 These migrations were very important in the history of eastern, central, and southern Africa. Most of the peoples living in these regions today are decedents of these migrants or from peoples formed as a result of the integration of Bantu migrants with indigenous groups. Importantly, the migrants brought with them new skills that changed the economic, social, and political practices in their new homes. Agriculture (the growing of crops and domestication of animals), the skill of mining and smelting metal, and methods of forging tools and weapons from copper, bronze, and iron, were first introduced by the migrants. Along with these practices, the migrants brought with them new ideas of social and political organization that resulted in the development of many important kingdoms in East and Southern Africa. Trade, the exchange or movement of goods and services between people, is one of the oldest human activities. As in other regions of the world, Africa has a rich tradition of trade, both within Africa, between various regions, and between Africa and other regions of the world. There are numerous examples in African history of long-distance trade within the continent. For example, on the map you will find a number of trade routes that crossed the Sahara desert from west and west-central Africa into north-central and northwest Africa, and from there goods from the interior of Africa were exchanged across the Mediterranean Sea with southern Europe. A future history module will demonstrate that the two most important items of trade along these trade routes were gold from the forest and savannah regions of West Africa and salt mined in northwest Africa. This particular trade had important political and economic consequences. The great West African kingdoms of Ghana, Mali, and Songhai became powerful in part because they were able to control the trans-Saharan trade routes. Movement of people is not always voluntary. As will be shown in more depth in a future module, between the 15th and 19th centuries Africa experienced one of the most evil, forced movements of people in human history. Historians are not certain of the exact number of people from West Africa who were transported against their will across the Atlantic Ocean to be sold as slaves in South and North America. However, there is general agreement that more than 15 million left West Africa for the treacherous journey across the Atlantic Ocean. In addition to the people who were actually enslaved, millions of additional individuals lost their lives as a result of raiding parties to capture slaves and during the forced migration of people from the interior to the coast of West Africa. While the West African Atlantic slave trade was the most massive and destructive forced movement of people in African history, other long distance slave trade systems also impacted Africa during this same time period. In East Africa, slave raiding parties from southwest Asia invaded the interior of the region, raiding for slaves in as distant locations as current day Zambia, eastern Congo, and Uganda. Individuals captured by these raiding parties were taken to the coast and sold as workers to either coastal plantations or spice farms on islands in the Indian Ocean. 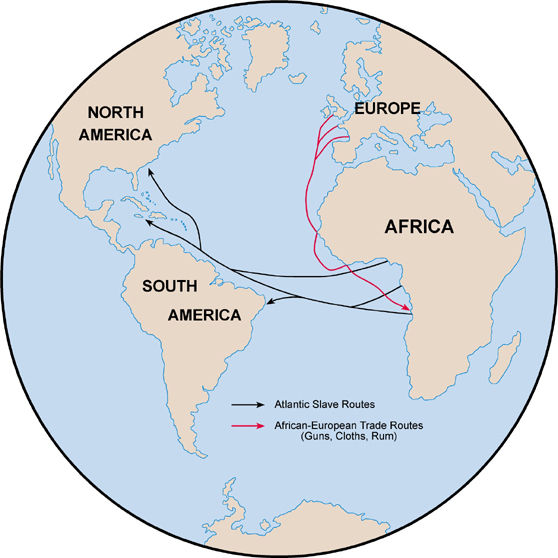 As with all movement of people, the movement of the slave trade impacts both the area of origin and the area of destination. However, in the case of the slave trade the impact was totally negative on the area of origin. In addition to the tremendous human suffering wrecked on individuals, whole societies in East and West Africa where devastated by the slave trade. Indeed, considerable evidence suggests that economic, social, and political institutions in parts of West and East Africa were so harmed that they were unable to fully recuperate prior to the coming of colonial rule. While the Atlantic Slave Trade led to incredible human suffering and injustice among the slave populations in North and South America, the African peoples made tremendous economic, social, political, and cultural contributions to the societies that enslaved them. For example, the standard of living in North and South America would be much lower but for the contribution of Africans in the Diaspora. Future modules will detail the many other cultural, social, and political contributions of Africans in North and South America. The West African Atlantic slave trade was Europe’s first direct, long-term engagement with Africa south of the Sahara desert. This slave trade gradually ended in the nineteenth century, but by the time that the slave trade was effectively ended, a number of European countries began a new type of engagement with Africa. Between 1885 and 1914, all of Africa, with the exception of Ethiopia and Liberia, came under the colonial control of one of seven European powers: Britain, France, Portugal, Germany, Belgium, Italy, and Spain. Future lessons will detail the colonial experience in Africa, but this lesson will demonstrate that colonialism initiated, and was dependent on, massive movements of people and goods within colonies, between African colonies, and between Africa and Europe. In the nineteenth century, European states were undergoing the industrial revolution. New industries needed both sources of raw materials and expanding markets for their industrial goods. These two needs were among the reasons that stimulated the colonization of Africa. African raw materials, agricultural and mineral, were important to the continued growth of European industries. Similarly, African colonies offered European industries new markets for their goods. Colonization led to a massive movement of raw materials out of Africa as exports to Europe and the imports of manufactured goods from Europe into Africa. This movement had a definite impact on both Africa and Europe. European societies were enriched by this movement. However, the result on African colonies was not as positive. Since European countries controlled the colonies, profits coming from the sale of African produced raw materials did not stay in the colonies where profits could have helped promote economic development. Instead, profits flowed out of Africa to Europe. Similarly, the importation of manufactured goods from Europe made it more difficult for young industries to develop in Africa. Colonialism also resulted in the massive movement of people in many African colonies. Most of the movement was directly related to the exploitation of Africa’s natural resources. Large numbers of people, working as laborers, were needed to produce raw materials for export. For example, the production of cotton for export from West Africa necessitated the movement of workers into areas for cotton production. Similarly, in Zambia (Northern Rhodesia) where copper was the primary export, large numbers of men moved from areas distant to the mines to fill the labor needs of the mines. Much of the labor migration took place within countries. However, in southern Africa, labor migrants were recruited from neighboring countries to work in the mines of Zambia, the Congo, and South Africa. These movements resulted in the growth of large urban areas, but they also have had a negative impact on many rural areas where able bodied men were forced to leave their home areas to work in mines and on large farms, leaving their families and communities with a shortage of labor to produce food and other goods necessary for survival. Strong evidence suggests that many regions of rural Africa suffered economically as the result of labor migration. Colonialism in Africa also facilitated the movement of ideas, knowledge, and cultural expression. Although Christianity has a long history in Africa, the religion was introduced to large parts of western and southern Africa for the first time as a result of colonialism. Colonial officials supported the work of Christian missionaries. As a result, Christianity expanded rapidly during the colonial era. By the end of the twentieth century, nearly thirty percent of Africans identified themselves as Christians. Christian missionaries worked with colonial officials to introduce formal schooling in many African countries. There were positive benefits to schooling; however, schools, missionaries, and colonialists often represented African knowledge and beliefs as being of no worth at best, or as primitive and superstitious, at worst. Supporters of colonialism justified their support through negative representations of African values, beliefs, and culture. Yet in spite of attempts to portray African cultural practices in the most negative manner, African cultural expressions in music, dance, and art, not only survived, but made their way to Europe and North America where they had a strong impact on art, music, and cultural expressions. Future modules that focus on African art, music, and literature, will show how these cultural forms influenced these art forms globally. 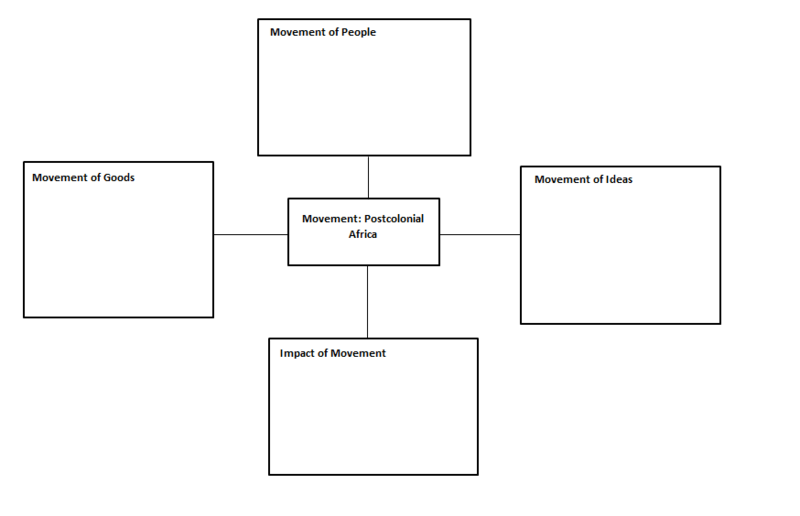 Using information from the text on Movement in Africa: Post-Colonial Africa, find examples of the movement of people, ideas, and goods, and the impact of these movements. Fill in your answers in the appropriate box of the graphic organizer distributed by your teacher. The first African colonies to gain political independence were Libya, 1951; Egypt, 1952; Morocco and the Sudan in 1956. 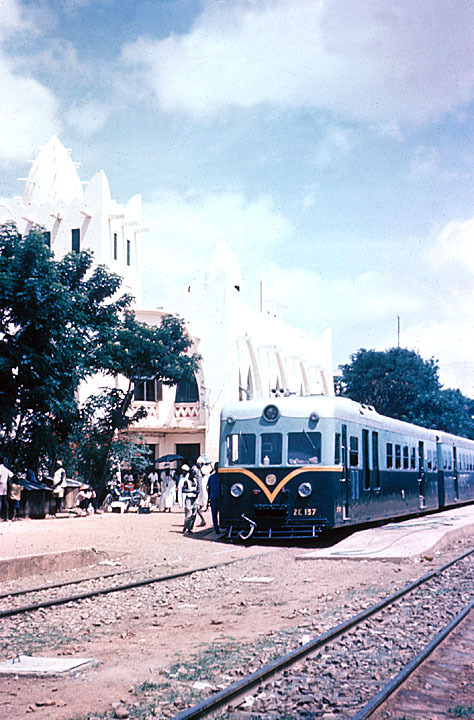 Ghana followed in 1957 and Guinea in 1958. 1960 was a big year for African colonies; 15 countries gained their independence. By the mid 1960s, most African colonies were politically independent. 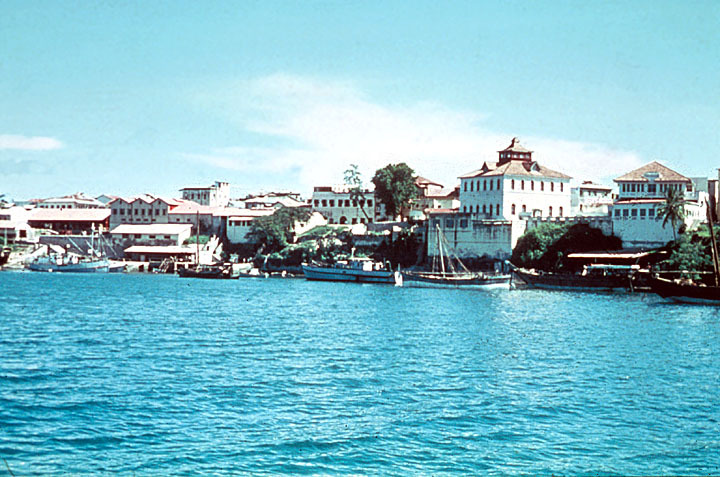 The exceptions were the Portuguese colonies of Angola, Guinea-Bissau, and Mozambique; the British colony of Rhodesia; the Ethiopian colony of Eritrea; South Africa and its colony Namibia. With the exception of Namibia, all of these colonies had European settlers who resisted African lead independence. However, by 1994 when South Africa came under majority rule, all former colonies in Africa were politically independent. Historians refer to the last forty years in African history as the post-independence or post-colonial period. Rural to Urban: Continuing a trend which began in the colonial era, during the past 40 years in most African countries, an increasing number of rural dwellers have moved from rural areas into towns and cities in search of jobs and basic services, such as education and health care, which are not as available in most rural areas. As a result of this movement, numerous African cities have populations of two to three million people. 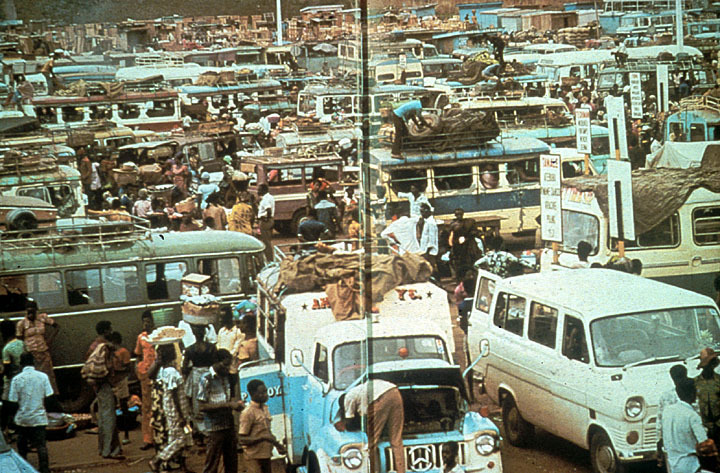 Module Nine: The Economics of Africa will detail the reasons for and impact of rural to urban migration in Africa. Movement to Neighboring Countries: Some African countries are in a stronger economic position than their neighbors. Consequently, in the past twenty years, there has been a growing migration from poorer to better off countries in the same region. For example, large numbers of people from the land-locked countries of Mali and Burkina Faso have moved southwards into Cote D’Ivoire because of more economic opportunity. Similarly, since the transition to majority rule in 1994, South Africa has attracted many migrants from neighboring countries such as Mozambique and Zimbabwe. Movement of Refugees: Module Ten: The Politics in Africa will provide details on political unrest in post-colonial Africa. While most African countries have not experienced political unrest since their independence, there are some notable exceptions to this trend. For example, political unrest in countries such as Angola, Burundi, the Congo, Ethiopia, Liberia, Rwanda, Sierra Leone, and the Sudan have resulted in the displacement of many people who were forced to move as refugees into neighboring countries. Brain Drain: In recent years, an increasing number of educated Africans have migrated out of their home countries to Europe or North America in search of employment. Again, Module 9 will provide more detailed discussion on the brain-drain. The economic systems of most African countries have not changed much since independence. As during the colonial period, most African economies are based on the export of raw materials – agricultural and mineral. Similarly, these economies are dependent on manufactured goods imported from Asia, Europe, and North America. You should note on the map that the movement of exports out of and imports into African countries does not include trade between African countries. This too is a legacy of the colonial economic systems that were built on trade with Europe and not trade within Africa. You have probably heard or read the term Globalization. Many different ideas are associated with Globalization. However, a general understanding suggests that in the past half century, many of the barriers of distance between regions of the world have been broken down as a result of modern communication: wireless connectivity through satellites has greatly enhanced radio, television and telephone communication; most recently computer technology has enabled real- time connection between people and regions remote from each other. One result of this global communications revolution has been the rapid and wide spread of news, knowledge, ideas, and cultural expression, such as music. These technologies have allowed and facilitated exchange between Africa and the rest of the world. So for example, modern communication has allowed for the “export” of a wide variety of African music to the rest of the world. New genres of fusion music have developed as a result of the exposures assisted by modern communication technologies. Your teachers may want to ask you to share examples of contemporary music influenced by world music. It is easy to be impressed by these modern global technologies and the ease by which people can gain access to other regions of the world. However, you should note that these technologies are expensive and often dominated by individuals, institutions, and companies in North America, Europe, and parts of Asia. Control over the technology determines in part what news (and whose perspective of the news), knowledge, ideas, and cultural expression are accessible and disseminated. Moreover, some observers of globalization warn that new forms of cultural expression supported by the new technologies may led to the creation of uniform cultural forms, while silencing regional and local forms of expression. Go to Activity Six or go to one of the other activities in this module.